Does colon cancer hurt? Worrying that something is going to cause you pain is a completely normal reaction to learning that you have colon cancer. Unfortunately, the answer is not as straightforward as the question. Every person is an individual, which means that what you experience during treatment and recovery may not be the same as what I would experience. A deep, aching pain from compression of your organs or tissues (metastatic tumors can cause this pressure). Skin or nerve ending pain — usually in your feet or hands — is a common side effect of some of the plant-based chemotherapy agents. Discomfort from skin burns, which are a side effect of some powerful radiation treatments. Surgical pain following a bowel resection. Generalized discomfort — you might be exhausted, nauseous, or just feeling poorly as your body fights cancer. It is important to report any pain or uncomfortable sensations to your doctor. Don't make the common mistake of trying to "wait it out" or worse yet, self-medicating. Non-prescription drugs and alcohol can compound your pain problem and won't give you the relief you need. Does it feel worse with movement or rest? How long does it last? Seconds? Minutes? Is it constant? Where do you most commonly feel it? In your abdomen? Back? Be specific. On a zero to 10 scale, zero meaning no pain and 10 being the worst pain imaginable, what number would you assign to your pain most frequently? What does it feel like? Is it an ache? Burning? Use descriptive words. How have you been treating the pain? Do you take over the counter pain relievers? Lie down and rest? Did you ever experience this pain prior to your cancer diagnosis or is it a new pain? Pain can impact your quality and zest for life. If you are having pain that impacts your movement or ability to carry out normal activities it is definitely time to talk to your doctor. If warranted, your doctor can provide a prescription for pain medications to keep you more comfortable. Read the insert on your new medication and don't be afraid to ask questions. There are two types of narcotics for pain control: Short-acting and long-acting. The short-acting medications are usually taken only as needed and stay in your system for four to six hours depending on the drug. Long-acting medications are usually prescribed on a routine basis to develop steady, constant pain relief. 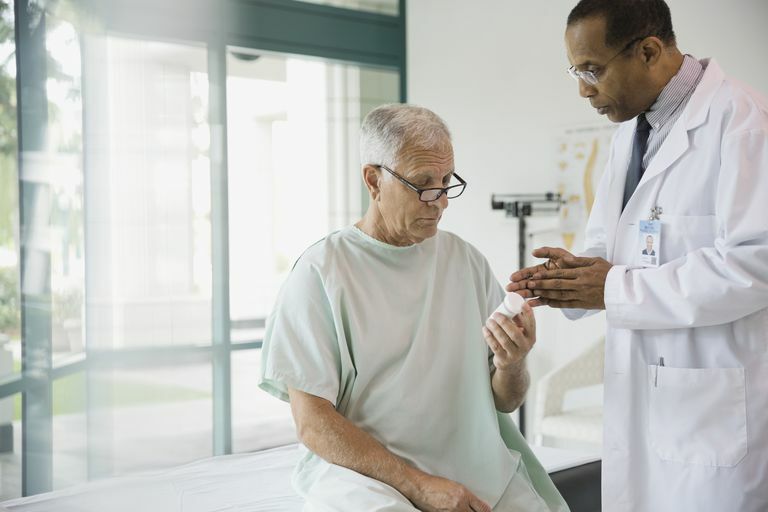 If you've never taken narcotics for pain control your doctor might start you on a short-acting pain medication to see how often you need them and how well they work for you. It is important to keep a pain diary — write down when and why you took the medication and bring this diary to each appointment. It will help your doctor determine if the medication is the right choice for you. Do not share your new medication with anyone. Be sure to take your first dose when you will be able to stay safe at home and see how it affects you. Many medications can cause dizziness or sleepiness (somnolence) and it would be unsafe to drive or operate heavy machinery until you know how your medication affects you. Do take the pain medication if you need it. If you are suffering pain and use the medication correctly you will not become addicted to it. Take the pain medication before the pain becomes debilitating. It is much easier to get mild pain under control. If you wait until the pain is unbearable, the pain medication may not fully relieve the discomfort. Also, be sure to let your doctor know if you are suffering any side effects. It is usually easy to relieve these side effects, so do not delay in reporting them. If you are still suffering pain or the medication is not helping, talk to your doctor. He or she can help you develop a pain control plan that might also include non-pharmacological interventions such as rest, cold or heat therapy, or adjuvant alternative pain control methods such as massage. American Cancer Society. Caring for the Cancer Patient at Home: Pain. 06/08/2015. American Cancer Society. Managing Cancer Pain. 9/23/2015.